The origin of the sailboat by the name Teuton 800 is easy to guess. In fact, the company that manufactures it, the Nusser Yacht, is located in Germany, in the Bavarian city of Offingen. Far from the sea, but close to the banks of the river Danube, the company has found the right formula to make the dream of many Germans - and not only - come to life: the dream of owning a light and fast sailing boat of a small size, customisable in its design and on-board equipment, and an excellent value for money. Teuton 800 is now very popular among sailing enthusiasts and, in recent years, the company had to review its space and logistics to meet the growing demand of the market. Nusser Yacht was born as a shipyard specialised in the restoration of vintage boats: "It all began many years ago, when I was looking for a sailboat for personal use. Since I couldn't find a model that would fully meet my needs, I decided to design and build one entirely by myself. I should mention that I had previously been a young sailor, so I didn't have to work very hard to make my dream come true," says the owner Gerhard Nusser. "This passion has stayed me all my life and it is what made me a boat builder". 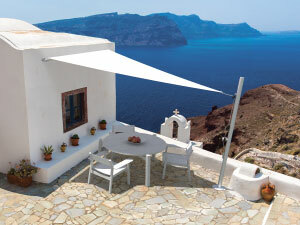 The production department is, therefore, divided between nautical design and restoration of old boats. 2018 marks a first step towards a more complete logistical overhaul of the company with the installation of a temporary building made of aluminium and a large PVC sheet, produced by the Italian company Giulio Barbieri S.r.l. 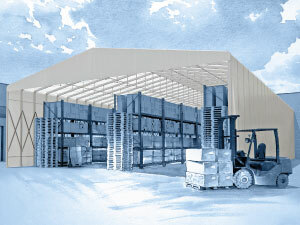 who specialises in snow- and windproof temporary warehouses. "We chose an industrial tent to facilitate the movement of boats and not to occupy the open area of the yard permanently. After doing a thorough market research, we chose a retractable tunnels of the Italian company Giulio Barbieri, which is made in alluminum, as the other similar iron structures were too heavy to allow manual handling, given the large dimensions of the structure. And then the iron deteriorates and regular maintenance has to be done >> " says Gerhard. "From a regulatory point of view, in the specific case of our municipality, an industrial tent is classifiable as a temporary structure. As a result, the bureaucratic process has been much simpler and less expensive than the one for the construction of a new masonry shed, which is already scheduled for 2019. Teuton 800 has been a great success and now we need to expand the shipyard, adding a new department reserved for the prototyping of new models. At that point the temporary building will in any case continue to be useful for the shelter of boats and for restoration operations". Temporary building READY BO6 Giulio Barbieri S.r.l. Aluminum structure with fireproof PVC fabric. The company is therefore preparing to reap the benefits of its winning strategy, which is to address the general public with semi-custom solutions that are among the favourites in the marine industry, as they manage to combine short construction times with the advantages of a customised project. 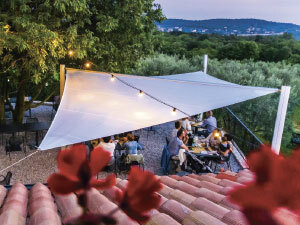 The success of Teuton 800 comes, first of all, from the careful choice of materials. In the nautical sector, carbon is currently very popular. It is used in the production of objects requiring great mechanical resistance without sacrificing lightness. But even if over the years its cost has decreased significantly, it continues to have a considerable impact on the final price. "Carbon is absolutely essential in the field of sports and racing boats, such as offshore races. Its use in safety cells has saved the lives of many pilots. However, carbon is a very fragile material and can sometimes break without any warning signs," says Gerhard. "But in pleasure craft, you can achieve excellent performance even when using a cheaper material for the plating: high-quality fiberglass, combined with epoxy resins, allowed us to achieve fantastic results. With a total weight of the hull of less than 400 kg, the boat becomes very agile, fast, and has an even lower consumption. But let's not forget that Teuton 800 is a custom boat and for the more sporty individuals we have a Racing Ronstan Equipment with carbon reinforcements." In short, lightness is really important, because a boat that consumes less fuel is also an ecological boat that pollutes less. The engineers at Nusser Yacht have not only tried to contain the production costs of the hull, but have also come up with a design that allows for a complete customisation of the boat. You can, in fact, choose between different types of keel, sails, mast, and rigging. The hull is available in three different models. The first one is a 20's style hull without a keel, the second one is a hull with a fixed bulb keel, and the third has a centreboard, whose draught can be reduced from a maximum of 1.70 meters to 0.70 meters. In the latter case, therefore, the boat, 8 meters long and 2.55 meters wide, can be easily transported on a trailer and even lowered into the water using a suitable ramp. For each of these models different kinds of rigging (the structure that includes the mast, the shrouds, the spreaders, the stays, etc.) are also available. The third model, in addition to the centreboard, also has a folding mast, which further facilitates its transportation. The gennaker is obviously intended for those who wish to participate in regattas. In this case, additional sports equipment is available, such as carbon fibre reinforcements and Racing Ronstan Equipment (Rod Rig). Nusser Yacht was born in the heart of Europe to manufacture sailboats that fully satisfy the desire to sail that affects especially the Germans, known throughout the world as a people of travelers, characterised by a great curiosity and spirit of adaptation. We just have to wait for the new models that will join Teuton 800 in the coming months... and make the boat of our dreams come to life! 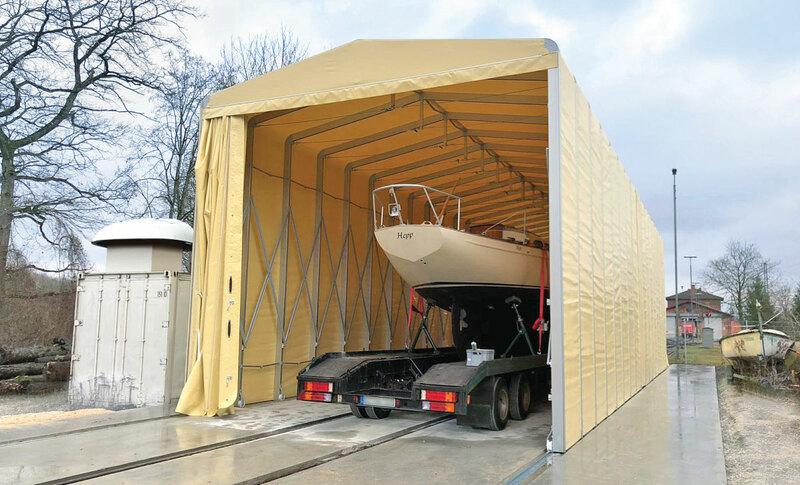 Are you looking for a large, snow-resistant temporary building that is easy to open and close?